One key to surviving graduate school is writing. A recent analysis of job ads published in the APS Observer found that, on average, PhD students who go straight into a tenure-track position have six publications (Valla, 2010). The average varied by discipline: for cognitive psychology, it was an average of 6; for developmental psychology, it was an average of 3; and for social psychology, it was an average of 12. In addition to manuscripts intended for publication, you will likely write a master’s thesis, research proposals and papers for classes, IRB applications, grant proposals, talks at conferences, poster presentations, award applications, and the all-important dissertation. Clearly, writing prodigiously is an important skill to master. 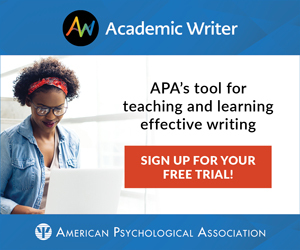 There are many steps to the writing process that all deserve your time and attention, and several others have offered a number of insightful tips for writing in psychology (e.g., Preacher, 2003; Roediger, 2007). However, tips for convincing and successful writing are only helpful if a person can find the time and motivation to engage in the writing process. A question we have all asked ourselves at one moment or another is “Why aren’t you writing? Right now?” Whether it is our dissertation, the paper that’s been “in prep” for over a year, or the reaction paper due for our seminar class in an hour, we have all put off writing. We have procrastinated. The question is not whether or not you will procrastinate, because the chances are high that you will. The question is what you will do when you are procrastinating. Here are a couple of strategies to make the seemingly inherent drive to procrastinate more useful. Procrastinate on “Task A” by working on “Task B”. If you should be working on your dissertation, you might procrastinate by working on a different paper you are currently developing. Regardless of the specific tasks, you are still being productive while allowing yourself to procrastinate. Procrastinate on a “sub-task of task A” by working on a different “sub-task of task A”. If you should be writing the methods for a manuscript, you might spend your time outlining the introduction and the discussion. Familiarizing yourself with the literature is also an important part of the writing process and could serve as a procrastination outlet as well. Sometimes, however, you will still procrastinate, and your friends will be peppered with many useless Facebook posts along with incredibly cute photos of your new puppy. Sometimes we procrastinate because our mind needs a break. Learn to recognize these times and take advantage of them to actually take a break, but do not be too lenient in your criteria for taking a break. If you are, you will never get things done. You’ve Beaten Procrastination. Now What? Set up a consistent writing routine. When you do have that chance to write, try to use the same routine every time (for a similar suggestion see Kraus, 2009). Work in a place with a minimum amount of distractions, where you are comfortable (but not too comfortable), and write in this place as often as possible. For me, this location is the local coffee shop. For other people, it might be their home office, a nice corner of the library, or maybe their back porch. Regardless, take advantage of those learning principles you were taught in your introductory psychology course and put them to use in forming your writing habits. “Write” all of the time. Even when you are not at your computer or taking notes, you can still think about your manuscript. Think about the logic of the argument in the introduction, whether or not you can shore up the weaknesses of your method, if there is a better way to frame the results, or what you need to cover in the discussion. That way, when you sit down to write, you already have a sense of what you want and need to say. If you don’t trust the whims of your memory, write down your ideas as you go. Hopefully, this article has given you some ideas about how to sit down and write, and how to make the most of your precious time. But there is one wrinkle in all of this. What if you do not have anything to write about? Here are several suggestions to avoid this problem. Write down your ideas. You probably do not have the time to pursue all of the empirical and theoretical ideas that come to mind, but you will often have time to write them down. When you do have the time and motivation to start a new project, go back to these notes. Read a lot. Read exposés in the New Yorker or the Wall Street Journal. Read journal articles in and out of your area of expertise and interest. Read novels, short stories, or the so-called classics. Reading can give you inspiration for new studies and theoretical ideas, as well as a foundational understanding of the topics you will be writing about. As an added bonus, reading the writing of good writers and paying attention to what works and what does not work is a good way to begin to develop your own writing style. Everything is a potential publication. Think about everything you do academically as having the potential for publication. Use poster presentations and conference talks as an excuse to outline a paper and get feedback on a theoretical argument. Use papers for class to explore connections between your typical area of study and related areas covered by the course. If you have a conversation with a fellow student about a neglected aspect of the literature, form a collaboration, collect the requisite data, and write a paper. Writing is a difficult and time-consuming process. The frustration you feel finding the motivation to write and actually engaging with the writing process is natural. The key is to take that frustration and turn it into a well-crafted paper worthy of your audience’s time and attention. recently completed his dissertation research at DePaul University. He is now an assistant professor at Tilburg University, The Netherlands. His work examines the causes and consequences of moral and ideological beliefs across multiple levels of analysis. He can be contacted at M.J.Brandt@tilburguniversity.edu.